I'll be on Air America at 6:05 CST to talk about the latest employment disaster report. 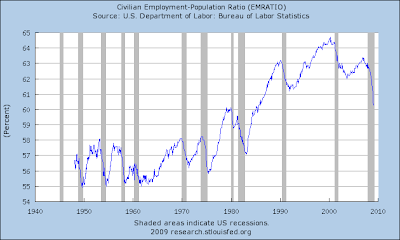 The Employment Situation in Pictures. Click on all for a larger image. There are presented in no order of importance. All have been updated with today's information. Nonfarm payroll employment continued to fall sharply in February (-651,000), and the unemployment rate rose from 7.6 to 8.1 percent, the Bureau of Labor Statistics of the U.S. Department of Labor reported today. 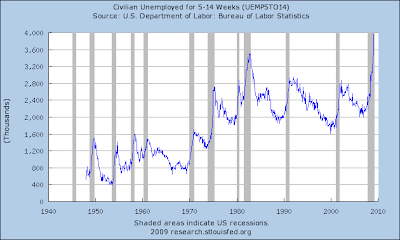 Payroll employment has declined by 2.6 million in the past 4 months. In February, job losses were large and widespread across nearly all major industry sectors. Let's break this information down. 1.) The best read of job growth for the last expansion is a total of 8.2 million jobs created. 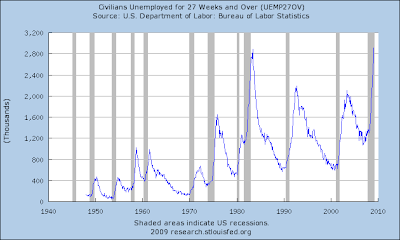 2.6 million jobs were lost in the last 4 months, or 31%. Since the recession began, we've lost 4.4 million jobs or 53%. There is no way to spin those numbers as anything except terrible. 2.) The number of people who worked part-time for economic reasons increased by 787,000. That's also a ton of people. That number has increased by 3.7 million over the last 12 months -- also a ton of people. That facts tells us two relevant data points. First, businesses are still cutting back sharply. Secondly, there is probably at least one more month of horrible job losses in the works; that number is simply too high for there not to be another serious round of job losses coming down the pike. 3.) Year over year, the unemployment rate of service occupations has increased from 6.7% to 9.1% the unemployment rate of natural resources, construction and maintenance has increased from 9.1% to 17.7% and the unemployment rate of production, transportation and material employment has increased from 6.6% to 13.1%. 4.) Hours worked is decreasing across a wide swath of industries. Simply put, this is an incredibly ugly report. Bottom line: this is a good example of a bullish chart. The 5-minute chart shows a clear downward trajectory interrupted by bear market flag patterns. In other words, people have been selling into the rallies. On the daily chart notice that prices are hugging the lower trend line of the downward sloping channel. Consumer spending remained sluggish on net, although many Districts noted some improvement in January and February compared with a dismal holiday spending season. Travel and tourist activity fell noticeably in key destinations, as did activity for a wide range of nonfinancial services, with substantial job cuts noted in many instances. Reports on manufacturing activity suggested steep declines in activity in some sectors and pronounced declines overall. Conditions weakened somewhat for agricultural producers and substantially for extractors of natural resources, with reduced global demand cited as an underlying determinant in both cases. Markets for residential real estate remained largely stagnant, with only minimal and scattered signs of stabilization emerging in some areas, while demand for commercial real estate weakened significantly. Reports from banks and other financial institutions indicated further drops in business loan demand, a slight deterioration in credit quality for businesses and households, and continued tight credit availability. Upward price pressures continued to ease across a broad spectrum of final goods and services. This was largely associated with lower prices for energy and assorted raw materials compared with earlier periods, but also with weak final demand more generally, which spurred price discounting for items other than energy and food. With rising layoffs and hiring freezes, unemployment has risen in all areas, reducing or eliminating upward wage pressures. A number of reports pointed to outright reductions in hourly compensation costs, through wage reductions and reduction or elimination of some employment benefits. None of this should be news to anybody. 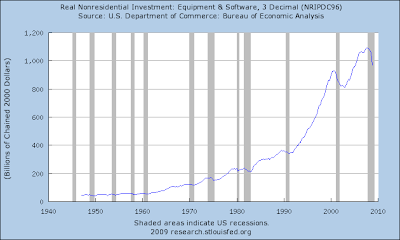 I wrote an article on 4th quarter GDP which has some relevant charts and graphs. Mr$. Bonddad is the HR director and an architectural firm in Houston. 1.) Last Friday she went to a recruiter event at an architectural school. Last year there were 26 firms; this year there were 6. And none of them were hiring. 2.) Her firm recently placed an advertisement from an administrative assistance. Last year she would have received between 50 and 100 resumes. This year she received 700. On the weekly chart notice that prices have been in a triangle consolidation pattern for the last three months. 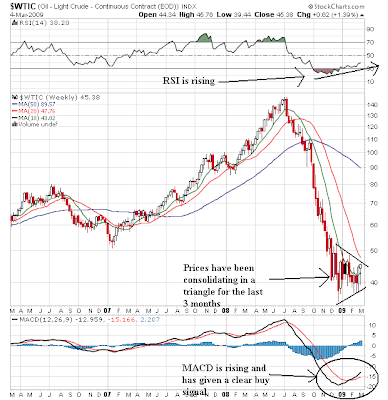 Also note the MACD is rising and has given a clear buy signal. 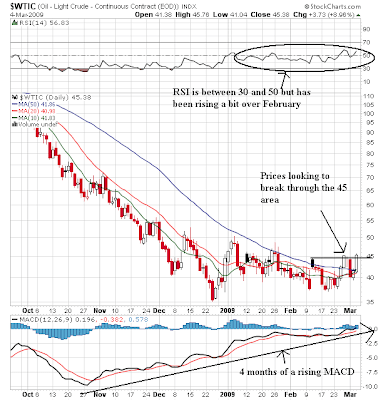 Also note the RSI is rising. Prices are above the 10 week SMA. There are two more areas of upside resistance that could keep prices from moving higher -- the upper line of the triangle and the 20 week SMA. 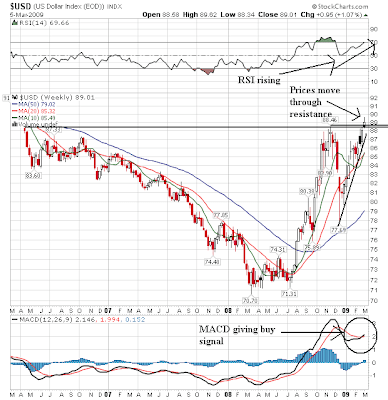 There's been a huge divergence between prices and the MACD over the last three months. Also note the RSI was hovering between 30 and 50 for most of that time but has posted some gains over the last fewweeks. From a price perspective, notice that prices were rebuffed at the 45 level recently but have since rebounded and are trying to move through the level again. Bottom line: this chart is looking pretty good from a bullish perspective. Today the market opened higher but then moved down to the 50 day SMA. The market repeated this several times throughout the trading day. Note the market sold-off at the end on a volume spike, indicating traders did not want to hold a position overnight. On the daily chart, notice we're still in a downward sloping channel. In other words -- we're not out of the woods by a long shot. Are We Going to 600 on the S&P? Tim Knight makes a strong case that it's possible. Watch the first half of this video. Issuance from the non-financial sector is good, but asset-backed and financial issuance is still weak. And spreads have definitely come down. All the Libor rates have dropped considerably. In addition, the same link shows a drop in mortgage rates. Companies with risky credit ratings are lining up to tap the speculative-grade, or "junk," bond market for funds as they fear the window of opportunity could soon close. 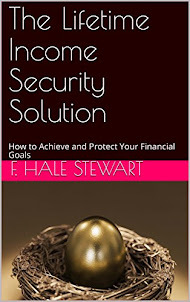 The recent turmoil in the stock market and continuing problems at large financial institutions including Citigroup and American International Group have heightened fears that those suffering big losses will be forced to sell debt securities to raise precious capital. Such selling could crowd out new debt sales, as had been the case last autumn. Still, it isn't cheap to issue debt in the high-yield market with interest rates for risky companies raising new debt coming in near 10% -- and that is after selling the bonds at a discount. But the incentive is there to get in while the water's still warm. It could always get worse. "There really doesn't seem to be any floor for how low things can go," said Scott Grzankowski, a former hedge-fund trader and now an analyst at KDP Advisor. "So if you have funding needs you might as well tap the capital markets now in case they seize up like they did three months ago." That's more than 8.3 million mortgages that were upside down at the end of the year, compared with 7.6 million three months earlier. It's a problem that is expected to get worse as home prices continue to fall. "The accelerating share of negative equity, combined with deteriorating economic conditions, means that mortgage risk will continue to increase until home prices and the economy begin to stabilize," said Mark Fleming, chief economist of First American CoreLogic, in a news release. First American CoreLogic is a Santa Ana, Calif.-based provider of real estate data and mortgage analytics. "The worrisome issue is not just the severity of negative equity in the 'sand' states, but the geographic broadening of negative equity that is expected to occur throughout the year," he added. "Sand" states include California, Nevada, Arizona and Florida. The main issue with copper is prices are near their lowest levels in three years. However, also note the 20 and 50 day SMAs are moving lower. However, the 10 day SMA has turned neutral. In addition, prices and the SMAs are tied-up, indicating a lack of overall direction. Aluminum is in a classic bear market pattern. Prices are below all the SMAs, the shorter SMAs are below the longer SMAs and all the SMAs are moving lower. In addition, prices have been in a downtrend since last summer. Silver benefitted from the recent rally in gold. Prices fell starting last summer but bottomed in the first part of the fourth quarter and have since been moving higher. However, notice that prices have run into resistance at the 50 day SMA recently. Although prices gapped up at the beginning of the day, they made three moves lower. Note that each successive move was higher -- which is good thing. That tells us there is buying interest 69.80/70 level. Notice the clear down/up/down movement over the last 10 days. 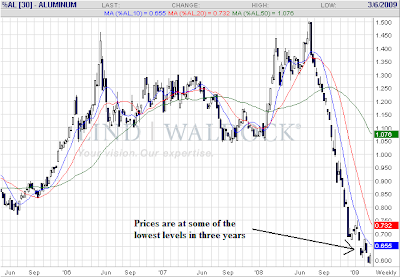 The daily chart shows that prices are below key levels. The good news is they haven't moved any lower. The bad news they haven't moved higher yet and are still just hanging there. The Obama team announced its intention to partner with the private sector to buy $500 billion to $1 trillion of distressed assets as part of its revamping of the $700 billion bank bailout last month. It's central to the administration's efforts to unglue credit markets, alongside a Federal Reserve program aimed at spurring consumer lending in areas such as credit cards and home loans that will be officially launched Tuesday. These private investment managers would run the funds, deciding which assets to buy and what prices to pay. The government would contribute money from the $700 billion bailout, with additional financing likely coming from the Federal Reserve and by selling government-backed debt. Other investors, such as pension funds, could also participate. To encourage participation, the government would try to minimize risk for private investors, possibly by offering non-recourse loans. I've had issues with nationalization -- primarily because no one has effectively dealt with the issue of preventing the type of corruption that led to the financial sector's problems from happening again. Over the last several weeks I endorsed a plan (and yes, I know that so many people are lining up for a Bonddad endorsement that it means so much) where the government would essentially create a "super-bank". I liked this idea because it only involved one bank -- meaning, there was only one institution to monitor. That made sense. However, this idea is interesting. The government and the private sector form a partnership with the government putting up money along with the private sector. In addition, the private sector would run the fund. The main problem is the fact that banks would have to sell their bad assets at some price -- which they have so far been unwilling to do. However, if we can get some savvy investment people to run these funds, it could be the start of a semi-private RTC that has intriguing potential. Despite hitting a high at the end of last year, the short term end of the Treasury market has been falling since. 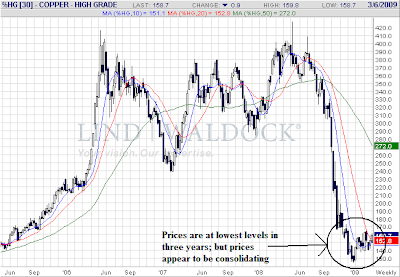 Prices are now in a downward sloping trend channel. Also note all the SMAs are moving lower. 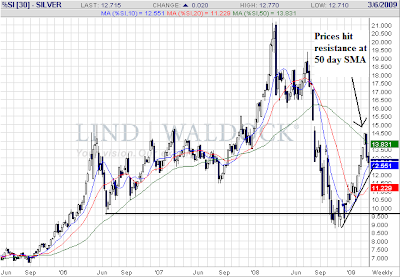 Prices have been running into upside resistance at the 20 day SMA. Prices dropped from a high at the end of last year and have been dropping since. But note that prices have been consolidating for the last 2-3 weeks in a triangle consolidation pattern. The main reason is prices have been caught between convergent market trends. On the bearish side, Treasuries were very overbought at the end of last year and needed to fall. In addition, there is tremendous downside pressure from the massive supply coming on the market. 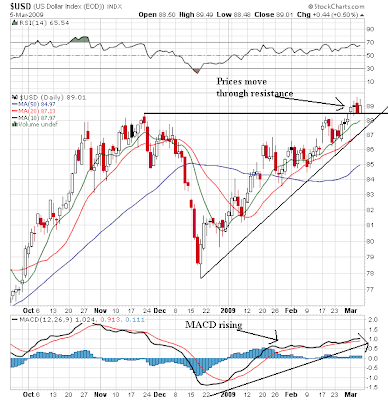 However, Treasuries are still the safe haven option which helps to stabilize the downside moves. On the IWMs (Russell 2000), notice that over the last few weeks we've had three gaps moving lower. Bottom line -- prices are in free fall right now. On the DIA notice that we've had four gaps down since the first of the year. Notice that today's action was an extreme downside move -- big time. All of these charts are bearish. Hell, all of these charts show a market in panic selling mode. There is nothing good here. Nothing at all. For a really interesting post, see this post from Corey over at Afraid to Trade. The DJIA fell to 6825 this morning. That means that the Oct. 2007 - present bear market is the 2nd worst in 138 years. The second worst, until today, was the loss of 51.51% from the market's 1937 high of 194.14 to 94.13. When the DJIA fell below 6833, we surpassed that percentage loss. The worst, obviously, was the 1929-32 contraction of almost 90%. 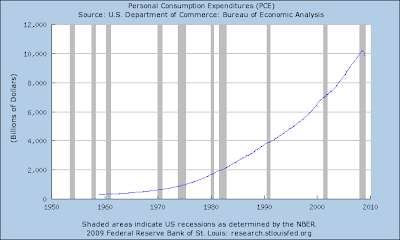 There are four components of GDP: personal consumption expenditures, gross private domestic investment, new exports and government spending. Let's look at each of these areas with graphs to see what they look like over the course of the last expansion which started in the fourth quarter of 2007. 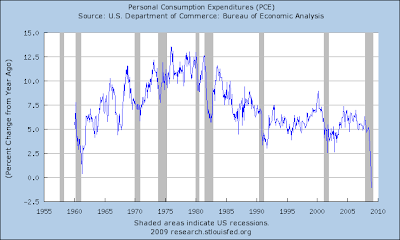 Personal consumption expenditures fell out of bed for the last two quarters, dropping 3.8% and 4.3% respectively. 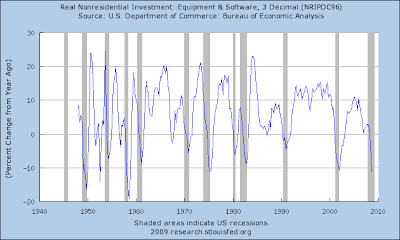 Also note the preceding three quarters (4Q07 - 2Q08) were weak as well, with growth of 1%, .9% and 1.2% respectively. 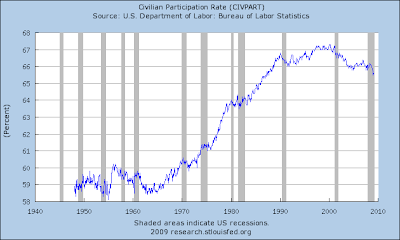 And the two quarters before that (2Q07 and 3Q07) came in at 2%. In other words, PCEs have been weakening for one and a half years. Let's look at this from two more angles. The above chart is the chart for the raw total of PCEs. Notice the latest drop-off is the largest in over 45 years. In and of itself, that should raise concern. But also notice the steep drop-off in the year over year numbers. That's also the largest drop-off we've seen in the last 45 years. The macro-number has been weak for 8 of the last 11 quarters. And one of the three positive quarters (3Q08) had a .4% growth rate. In other words, it wasn't anything to write home about. Let's take a look at the sub-components. 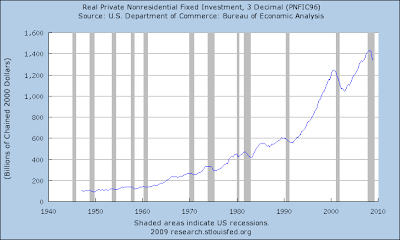 Real private residential fixed investment has fallen off a cliff for the last few years. 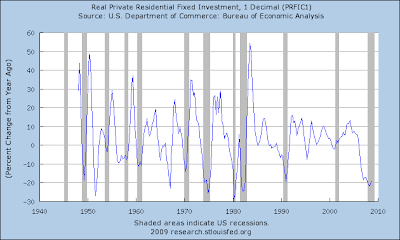 The reason are clear: residential real estate construction is also falling off a cliff. It's interesting that on the year over year level we've seen rates of decline at similar levels. 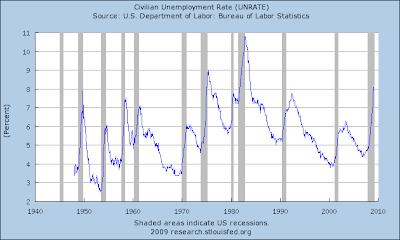 The year over year rate of decline is dropping but isn't at previous levels yet either. However -- I think the operative word there is "yet". 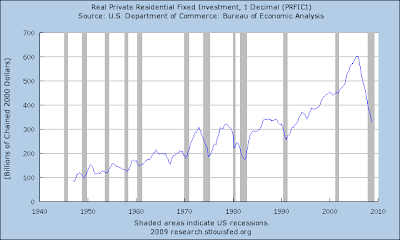 So -- the problems in investment started in the residential area, but have since moved to all major subgroups. 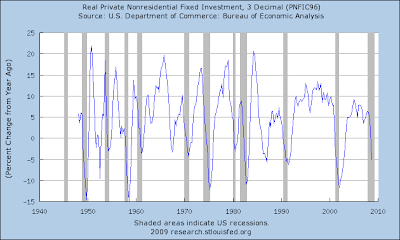 In addition, at the macro level, the drop in residential investment has been strong enough to make 8 of the last 11 quarters negative. In other words -- it's been bad for sometime. Exports were the one solid performer -- until last quarter when they dropped over 20%. Imports dropped as well due to the lack of consumer demand. The bottom line is simple: there is no area of the economy looking good right now. In January, late payments on credit cards hit a record high, according to Fitch Ratings. By year end, Fitch estimates that credit-card defaults, or balances that credit-card companies write off as uncollectible, will surpass the previous record of 7.7% recorded by the Federal Deposit Insurance Corp. in the first quarter of 2002, and approach 9%. Defaults hit a record low of 1.37% in the first quarter of 1984 and hovered well under 5% during the recent boom years, according to the FDIC. 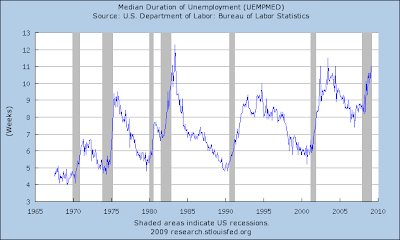 Moody's predicted the charge-off rate index could move into double digits by the end of this year if unemployment keeps rising. The government releases the February unemployment rate, which could touch 8%, next Friday. The January delinquency rate, which forecasts the charge-off rate, climbed to 5.94%, the highest in 17 years. The record high of 6.31% in January 1992 is likely to be passed in the months ahead, Moody's said. Meanwhile, payment rates, which have been falling since early 2007, are near a five-year low. In January, the principal payment rate fell to 16.39%, about 2.7 percentage points below the rate in January 2008. -- Prices have been declining for the last year. They hit a low point in November, bounced a bit higher but have been moving lower since the beginning of the year. -- Prices broke through key support over the last few weeks. Bottom line: these are incredibly bearish charts. Period.